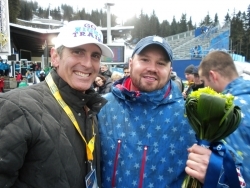 Los Angeles, CA, February 13, 2018 --(PR.com)-- Olympic bobsledder Steven Holcomb, who passed away last May, will be honored at this year’s Winter Olympic Games for his advocacy work on behalf of patients suffering Keratoconus, the degenerative eye disease that almost derailed his racing career. After undergoing the procedure and additional lens implants, Holcomb made a full recovery; his vision was restored to 20/20. He was declared fit to race, and steered the U.S. bobsled team to an Olympic gold in Vancouver - America’s first gold medal win in four-man bobsled since 1948. He also collaborated with his eye surgeon, Dr. Brian Boxer Wachler, on a foundation called Giving Vision - to award grants to needy Keratoconus patients for travel expenses and, in several cases, the entire cost of the sight-saving procedure. Since its formation, Giving Vision has saved the eyesight of over one hundred patients.